Tabrazier is a fire basket for on the table. 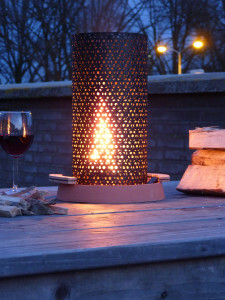 It offers those with only a small garden, balcony or roof terrace the opportunity to use a fire basket. The bottom part of the design protects the table from getting too hot. The perforated steel keeps the sparks and fire inside. The size of the basket is adjusted to the size of the standard woodblocks, which you can buy at any gas station.